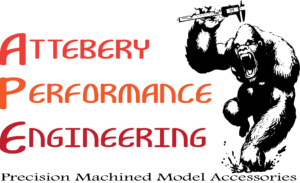 Attebery Performance Engineering is proud to bring the APE Mass Monkey Loft to LDRS 37! 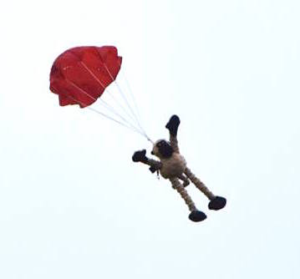 That’s one giant leap for Monkeykind! The APE Mass Monkey Loft is a drag-race style mass launch of monkeys flown in large diameter rockets, and it includes a spot-landing competition. 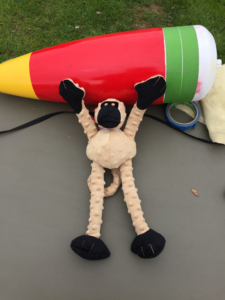 A banana landing target will be placed in the field, and the monkey that lands closest to the banana in each heat will win an Attebery Performance Engineering Head End Altimeter Bay for 7.5″ Nose Cones. Monkeys must return safely to earth on a separate parachute from the rocket. There will be two heats, one for H class motors, and one for I class motors. And there will two winners, one for each heat. The APE Monkey Loft will be held on Friday, May 18, at 1pm. For your planning purposes, these monkeys measure 18” from fingertip to toe and weigh 5.8 oz. 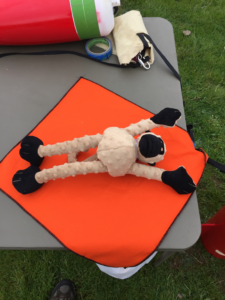 Monkeys are known for flexibility, and these can easily be folded into a ball and wrapped in a fireproof chute protector to form a monkey burrito that is about 9” long and fits easily into a 7.5” airframe. You provide the parachute (18” – 24” recommended), chute protector (18” works well), chute release (if desired), large-diameter monkey-lofting rocket (7.5” diameter recommended), and H or I class motor. To allow the mass launch to be conducted on the closest bank of high-power pads, the APE Mass Monkey Loft will be limited to H and I motors. There will be two heats, one for H motors, and one for I motors, and there will be a prize awarded for each heat. Flying a large diameter rocket on H and I motors can result in some very low flights, which is exactly what monkeys prefer, and is what is recommended for the Mass Monkey Loft. Aim for flights between 600 and 1,000 feet for the best monkey viewing, simulate your ejection charge delay timing accordingly, and pick motors carefully to ensure adequate thrust and speed off the rail. Some examples of high-thrust, and relatively low-impulse motors you might consider are CTI H295, H340, H399, I345, or AT H283, H550, I300, I357. These are just some of the examples that may provide safe, low flights, depending on the weight and size of your rocket, and there are other options as well. Choose wisely! 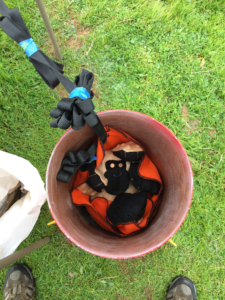 Note: Please know the exact total impulse of your motor at the time of the launch so that we can show that the total combined impulse of all the rockets in the Monkey Loft complies with the limits for a drag race complex launch. The Monkey loft is divided into two heats, one for H motors and one for I motors. Note: Due to rules governing drag race complex launches, we may launch four full I motors simultaneously from the 300’ bank of high-power pads. And if the motors are smaller than full I motors, we may be able to launch more in one drag race, up to as many as seven I motors simultaneously, depending on the total combined impulse of all the motors. For this reason, we have four positions in the I motor heat designated as the first salvo, and four positions designated as the second salvo. Depending on the number of fliers and the motors selected we may be able to launch the I heat in one salvo, or we may need to break it into two salvos. Sign up below. 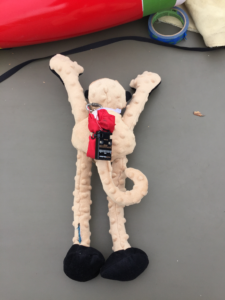 Pick up your free monkey at the APE vendor table at LDRS 37. And get ready for monkeys to fly out of your rocket! Next post: LDRS – T-28 Days!